Hello friends! I hope you all had a wonderful Christmas and wish you all a Happy and Healthy New Year! I'm sure all of you are looking forward to eating healthy for the start of the new year! :) I know I am and I really need a break from cakes and cookies. LOL! I just love a healthy salad for lunch or with dinner. 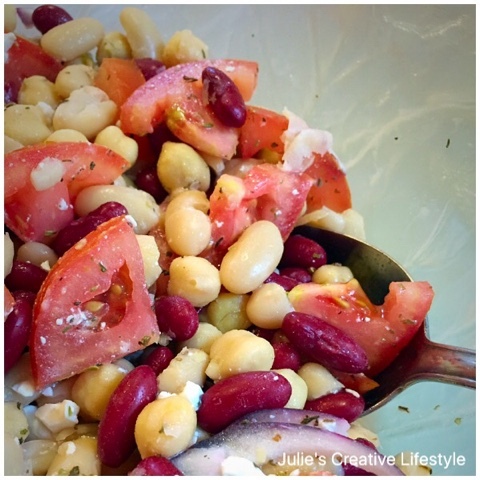 Today I have an easy to make, 3 Bean Salad recipe I'd love to share with you. This salad recipe calls for a few ingredients and tastes great. It's so easy to make and it can be ready to serve in minutes. I hope you enjoy this salad as much as my family does. 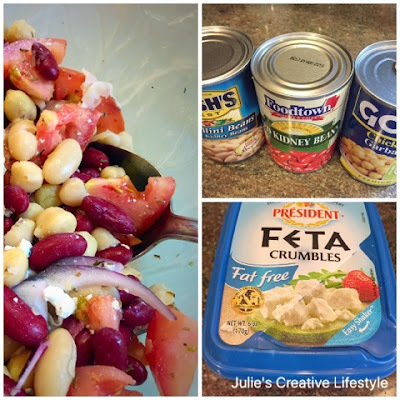 This is an easy bean salad recipe that can be served any time of year. 1. Drain and rinse each can of beans. Cut up tomato and red onion.2. Add the rest of the ingredients to a large bowl.3. Mix everything together. Wishing you all a wonderful end of the week and weekend. Jess and I will see you all back here on Monday for our Cooking and Crafting with J & J Link Up! Yum Julie. I love this. Packed with protein and lots of good vitamins. I am making this one for sure. This looks delicious! I adore beans and with the feta....YUM! Your recipes always look great Julie. Off to pin this one, too...Happy New Year! Love the idea of the feta in this salad. I bet it gives it that extra special 'something'. Hope you're well and warm! Thanks for the recipe, it looks amazing and I am going to make it. So colorful and so healthy! It looks delicious. Thanks for sharing it. Happy weekend! I love bean salads, especially served with some vegan cornbread. :) But my family isn't too keen on either. Happy New Year! Oh yum! I have all three of these beans in the pantry, get me some tomatoes and this will surely be on my plate soon. Thanks for sharing Julie. This looks so tasty and it's super healthy! Yay! This is was a great for lunch today! A side dish that I would make for picnic as well. Now that I can justified making your slutty brownies this week, lol! 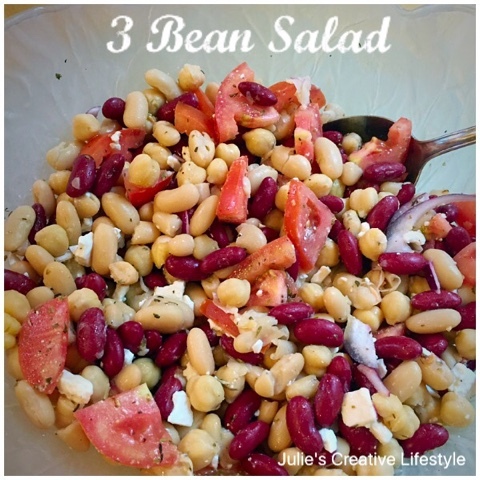 I love 3 bean salad. It always reminds me of my mom. She use to make a 3 bean salad that I just loved. I'm anxious to try your recipe. Thank you for sharing at This is How We Roll link party.